All that is known for certain beyond what is shown here is that Rev. John Starky's ancestors are said to be "of the ancient Lancashire and Cheshire family"... and the spelling seems to have changed with his marriage to the Bayntun heiress, as everything I can find (which is all in secondary sources) shows the spelling of the name in Lancashire and Cheshire to be "Starkey"... and possibly "Starkie" before that, although this connection is less clear. If I were employed and not worried about how to pay the bills next month, I'd buy my own STIRNET membership, because it looks like there is more to be found there (this is the paywall site mentioned in the popup in the image), but at the moment this is not feasible and I have found no printed sources beyond the book that got me started: "The Bayntun Family" by Hylton Bayntun-Coward. This source creates its own mystery. The author is the maternal grandson of George Bayntun of Bath (1872-1940), whose bookshop and bindery are still run by his family today, and they are descended in another line from the Bayntuns shown here, but the ancestors of George Bayntun himself are a complete mystery; nothing is said about his ancestry, and he is an apparent temporal anomaly; the Bayntun family name apparently no longer exists in the male line elsewhere beyond 1716. 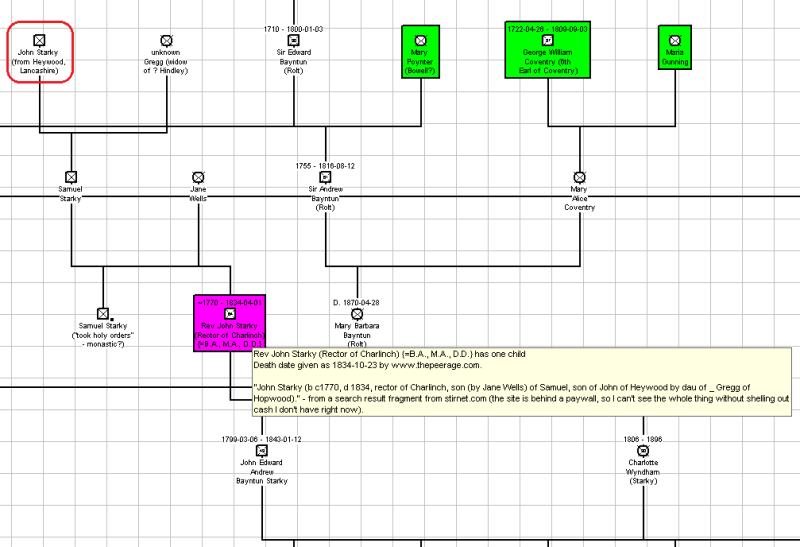 The red-framed individual in the top left is the last verifiable ancestor I have for that branch, and everything else I can find regarding the Lancashire and Cheshire family spells the name "Starkey" or (medieval) "Starkie". "Foster: s. of Samuel, of Skilton, Cumberland, doctor. QUEENS COLL, matric 28 Feb 1787, aged 17; BA 1791, MA 1809, BD & DD 1810; of Spye Park, Wilts; rector of Charlinch, Somerset 1808; died 1834"
It looks as though this record is on Ancestry, which I do not have at home. However in our library Ancestry there is no more information. Would need an image to see if there is any more detail. So not sure where the (Rolt) brackets come from. Is this in other records? Rolt is the family name before Starky... stupid post glitched and I lost everything but the first five words when I posted. I'm working without a mouse right now, and MouseKeys has been frustrating; I'm blaming it, not the forum software, for my lost post, just so we're clear. Edward Rolt (son and heir of Sir Thomas Rolt, whose ancestors have been equally elusive) married Anne Bayntun (whose brother died without issue). Maria Barbara is their great-granddaughter according to the "Bayntun Family" pedigrees and what few other sources I have managed to locate (none of which are any closer to being primary). Some branches of the family after this dropped the Rolt name in everyday use (which would explain why it was missing in the record you cited, and may also explain the mystery of George Bayntun's ancestors, if I can find the confirming records), so I put it in the "Second Last Name" field and left the Bayntun name in the Family Name field. I just haven't fixed the formatting on those individuals' names to take the parentheses off the Second Last Name. Many thanks for your contributions, appleshaw; the marriage date you supplied is consistent with (and more precise than) what I have in the "Bayntun Family" pedigree, which is apparently copied (with 45-year-old copier technology, and therefore being a bit on the grainy side) from an unidentified source, which I have had no luck tracking down. Other secondary sources are largely in agreement, however. I should also add that the ancestors of John Starky were a recent discovery, which is why I left his entity with the purple highlight. The connection was made by an estate name being found in common between them, more than any direct indications of kinship, and the dates were consistent with a father-son relationship... but they could be uncle and nephew as well, or the estate name may be a coincidence or an error. About the marriage record. This is my transcript of an image of 'St James, Piccadilly, St James the Less, Thorndike Street, Middlesex, England' from Westminster Marriages on FindMyPast. As this a WYSIWYG transcript, the Rolt name has to be on the second line, before the semi-colon, as there is no room on the first line. So she is being listed as a Rolt. Re: Rolt name: That was my understanding from the information I have; I've now changed the formatting on the relevant individuals, but I didn't want to bother replacing the image in the post. I have a functional mouse again, so posting has become a much less painful process. Also, now that I have a mouse again, I can start back into the serious online research looking for those missing ancestors. George Bayntun's ancestors are the particularly frustrating ones, because his grandson (who wrote the book I've been using as my main initial source for the family, but passed away in 2000) seems to be sure (from information given in the book) that George is related to the main Bayntun line... and it would have to be via one of the sons of Anne Bayntun and Edward Rolt who retained the Bayntun surname, as I mentioned earlier... but I've had no luck tracing even George's parents at all. This branch of the family lives in Bath, and the main Bayntun line (later Rolt, and after that Starky) lived in Wiltshire before the family estates were lost to gambling debts in the late 19th century, and beyond this point I have to rely on other sources... which have been difficult at best to locate. Over the last year I've been trying (with a prolonged break in activity from mid-November to about ten days ago, for a variety of reasons) to locate the ancestors of the Rolt family identified in my earlier posts in this thread. Mary's family, of course, is very well documented... but Edward's family is uncertain. According to the sources I have been able to access, he is the eldest son of Thomas Rolt of Bolnhurst, Bedfordshire and an unknown Kent of Aston... but Edward is also called the son of Edward by historyofparliamentonline.org. Further, Henry Rolt of Darent (Darenth?) is the father of Mary Rolt (1612-1696) who marries John Halladay... and their male-line descendants end with one John Henry "Doc" Holliday of OK Corral fame. Darenth is east of London and significantly south and east of Bedfordshire. My primary question is, how likely is it that Henry Rolt and Edward Rolt are related? The Rolt name does not appear to be particularly common... but my search for common ancestors of Henry and Edward (or, indeed, any ancestors at all apart from a disagreement over Edward's father's name) has come up empty.